Guerilla Knitting has become a design trend across the country. You may have seen Magda Sayeg's site, Knitta Please from Austin, Texas who is considered to be the mother of yarn bombing. Atlanta resident Brigette Flood was recently inspired by Magda's work and founded a knitting group in town that could create a similar impact. As she explains, "Yarn bombing is a way to knit big and make a colorful impact on an existing place or thing to make people take notice." The idea became to create an art installation for the Atlanta BeltLine, a developing green space that when completed, will encompass 22 miles of historic rail segments around the city of Atlanta. A public art initiative allows selected artists to showcase their work along the newly opened paths. 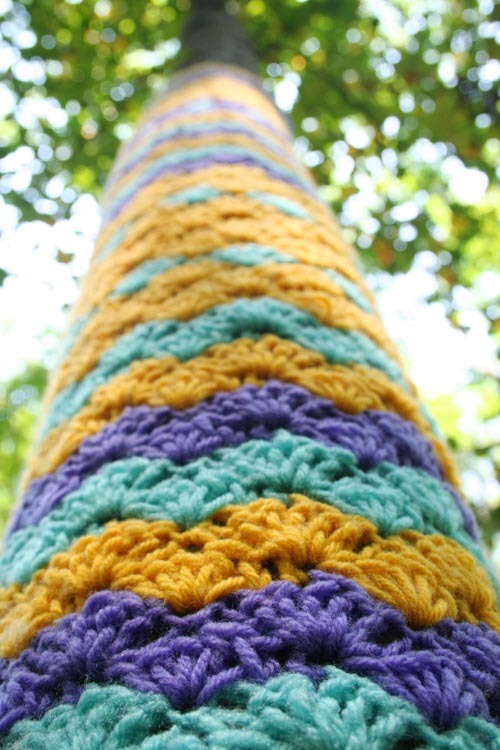 Brigette submitted the idea to yarn bomb a whole section of trees along a section of the BeltLine and it was approved. Brigette then gathered her team and together they mapped out their mission and gave themselves a name, The BeltLine Knitterati. Members include: Brigette Flood, the Yarn-Armed Leader along with knitters Julie Rivard, Annie Perry, Kate Swett and crocheters Sandy M. Tyler, Britt Dunn, Stephanie Haas and Kate Crosby. Britt is featured above and as Brigette explains, "He upped the ante with his awesome color combinations and amazing productive hands. We nicknamed him Britterati because he created so many pieces." For Sandy, this installation is a way to give back and to support one of her favorite places, "It's so significant that Atlanta is choosing to preserve this green space in the city and adding parks, walking paths and bike trails. I think the art is a great way of bringing pubic attention to the BeltLine and the selection of installation artists really reflects Atlanta's eclectic spirit." The Knitterati spent two days installing the fabulous arbor knitwear, receiving much needed help from family and friends. When discussing color choice and style, the Knitterati decided against uniformity, preferring instead to express themselves how they wished. Upon completion, they used over 150 skeins of yarn and had taken part in four "knitogethers" since they began the project in June. In just nine weeks time, they had enough colorful, one of a kind sleeves to cover over 40 trees! Each tree receives a personality jolt with their new fall outfit. I especially liked the red pom poms made by Sandy. She learned to make the yarn 'bubbles' from a book and was more than happy with the outcome, "I think it has a real sense of humor. It's very 'Cat in the Hat.'" The whole scene does take on the look of Dr. Seuss, doesn't it? The log sleeve is great too. Created by knitter, Julie Rivard, this quickly became a Knitterati favorite. I love the idea of making the sleeve fit seamlessly into the scene, as this camouflage piece does so well. Kate Crosby is behind this fall look that pairs trendy with subtle cool in the forest...I like it. Wearing Britterati, this old sign got a much needed makeover with a fashionable hat and a 'look-at-me-now' pink and red ensemble. The largest installation, which took over 30 hours to produce, is this colorful striped number made by Brigette. She explains that the idea was to "go big and help set the tone for the rest of the installation." Full of big, bold color, this knitted piece creates a high visual impact. She adds, "It's like the mama tree, big and overbearing but in a good way, full of warmth and colorful love. It also provides a unifying element. No matter where you are in the grove, you can see it." Two of the Knitterati showed me around the day I shot these photographs; Brigette Flood to the left and Sandy M. Tyler to the right- who you may remember from her Kitchen and Bath renovation. When I asked them what they hope others experience from their installation, they both had the same sentiment, "We hope they think it's pretty and an unexpected surprise." They encourage visitors to touch as well as look- exploring the various textures and patterns that change from tree to tree. If you're in Atlanta and would like to experience the fabulous BeltLine Knitterati 2011 Fall Collection, take the 20 West (if coming from the 75/85) to exit 54, Langhorn Street. Turn right off the exit and follow Langhorn as it curves to the right and meets up with Westview Drive. Turn left here and then an immediate left onto Napoleon Drive, SW. You can access the BeltLine from the cul-de-sac at the end of the street. You'll quickly see the bright row of trees to your right....enjoy! The installation will be up until November.